This project implemented changes to improve the transfer of care from John Hunter Children’s Hospital (JHCH) to HNEkidsRehab, for paediatric patients who need specialist rehabilitation care. To increase appropriate referrals of JHCH inpatients to a paediatric rehabilitation specialist, by 50 per cent by December 2018. To increase documented care type change (indicating the focus of care has changed from acute care to rehabilitation care) for paediatric inpatients receiving rehabilitation care, to 100 per cent by July 2018. Increases the number of appropriate referrals to paediatric rehabilitation specialists. Provider greater transparency in the referral review process. Improves the confidence of referrers regarding when, who and how to refer. Enhances staff morale and satisfaction. Improves clinical handover between services and sites. Reduces variation in clinical practice for children receiving rehabilitation care. Provides patients, families and carers with a better understanding of rehabilitation care. Reduces the patient’s hospital length of stay during rehabilitation. Improves the patient’s health and functional outcomes. Improves patient, family and carer satisfaction with the rehabilitation service. Paediatric rehabilitation is a specialist area of paediatric health that combines the principles of paediatric practice with sound rehabilitation care. It is designed for children and young people up to 18 years of age, who have a loss of function or ability caused by congenital conditions (such as Cerebral Palsy) or acquired conditions (such as acquired brain injury). Paediatric rehabilitation helps children and young people maximise their independence, quality of life and participation in their family and community, while minimising long-term health care and support needs. There is evidence that shows early access to specialist rehabilitation care can improve health outcomes, reduce hospital length of stay and optimise the use of health resources.1,2,3,4 HNEkidsRehab is the specialist paediatric rehabilitation service within Hunter New England Local Health District (HNELHD) and is based in the community. Inpatient rehabilitation is delivered by JHCH staff and HNEkidsRehab medical and nursing staff, while outpatient rehabilitation is delivered by HNEkidsRehab multidisciplinary teams based in the community. Prior to the project, there was a growing awareness that acute inpatients at JHCH were not consistently accessing paediatric rehabilitation. In 2016, 65 children were admitted to JHCH and had a hospital length of stay greater than 10 days. It was identified that these patients had a potential need to access rehabilitation care (due to multiple trauma, complex orthopaedics, neurosurgery, complex illness or disease) but did not receive it during their admission or following discharge. a disconnect between JHCH and HNEkidsRehab, including a lack of visibility of HNEkidsRehab medical staff at JHCH. Interviews with families who had received rehabilitation care were conducted in July 2017. The main issue identified was a lack of information available to patients, families and carers on discharge. Rehabilitation referral criteria were revised and clarified, in partnership with staff from JHCH and HNEkidsRehab. A checklist of indicators for the referral of inpatients to a paediatric rehabilitation specialist was developed, reviewed by JHCH staff and implemented on JHCH wards. Regular meetings were established with HNEkidsRehab, clinical nurse consultants, trauma and neurosurgical teams, to support earlier identification of children who may be candidates for rehabilitation care. 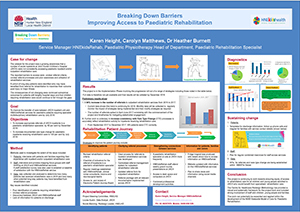 A clear process for referrals to inpatient rehabilitation services was developed. Access to a centralised referral management system for outpatient rehabilitation referrals was established, including an automatic feedback loop to the referrer. The referral form for outpatient rehabilitation was reviewed and updated. A referral package with all relevant documentation was created and implemented in JHCH, including all wards and rooms in the paediatric outpatient department, and the trauma team in John Hunter Hospital. A paediatric rehabilitation specialist was placed on-site at JHCH more frequently, from being on-site two occasions a week to being accessible five days per week. HNEkidsRehab staff were asked to attend weekly grand rounds presentations at JHCH, either in person or via videoconferencing. Negotiations were undertaken with JHCH to provide HNEkidsRehab medical staff with access to desk space and computers when they are working at the hospital. A schedule of professional development activities for JHCH and HNEkidsRehab staff is in development. An orientation program will be developed for new staff, incorporating processes across JHCH and HNEkidsRehab sites. The following solutions were developed to support patients who may need rehabilitation care but are discharged with the option to access this care at a later stage if required. A fridge magnet was produced, with details about how to access information on HNEkidsRehab once they have returned home. The HNEkidsHealth website was updated with information on the HNEkidsRehab service, including referral information and how to access care. The project team is working with the HNELHD communications team to share news and information via social media channels. A plan to support inpatients who need a comprehensive and coordinated discharge plan is underway. This will ensure ongoing care is organised and appropriate clinical handovers occur before discharge. staff satisfaction, measured by a survey conducted in August 2018. Stay true to the Centre for Healthcare Redesign Methodology. Be thorough with the planning and diagnostic work and don’t jump straight to identifying and developing solutions. Make sure you engage consumers and try to record and use patient stories to guide the project. Data identification, collation and analysis often takes longer than expected. Strong sponsorship is vital to the success of the project. Salter K, Hartley M, Foley N. Impact of early vs delayed admission to rehabilitation on functional outcomes in persons with stroke. Journal of Rehabilitation Medicine 2006;38(2):113-7. Stucki G, Stier-Jarmer M, Grill E et al. Rationale and principles of early rehabilitation care after an acute injury or illness. Disability and Rehabilitation 2005;27(7-8):353-9. Tal G, Tirosh E. Rehabilitation of children with traumatic brain injury: a critical review. Pediatric Neurology 2013;48(6):424-31. Wieczorek B, Burke C, Al-Harbi A et al. Early mobilization in the pediatric intensive care unit: a systematic review. Journal of Pediatric Intensive Care 2015;129-70.